The more “typical” showers and thunderstorms with frequent lightning and torrential rain joined the party 24 hours earlier than expected on Wednesday. Upwards of two inches fell across much of East Baton Rouge, West Baton Rouge, Ascension and Iberville Parishes. Storms over the coming days will be capable of the same and possibly even gusty wind on Thursday and Friday. Today and Tonight: On Thursday, a trough to the north will provide more instability for scattered showers and thunderstorms to develop, primarily during the afternoon hours. 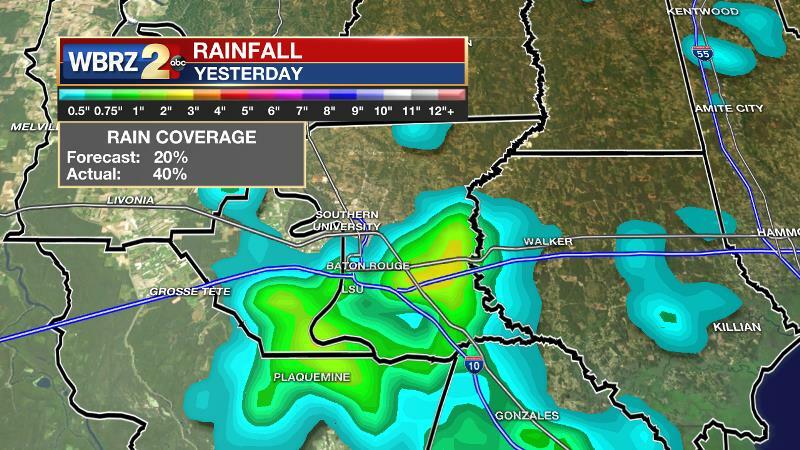 Rainfall is expected for about 50 percent of the 13 Parish, 3 County forecast area. With mostly cloudy skies, highs will just make it into the low 90s before convection develops. Overnight will be partly cloudy with lows in the mid 70s. Up Next: A similar setup will be in place through Saturday, with scattered showers and thunderstorms popping off in the afternoon hours. The added action will lead to shorter duration heat, but high temperatures will still top out near average in the low 90s. Nights will be quieter, with low temperatures in the low to mid 70s. Really, the 7-Day Forecast does not seem to offer much variation in the weather with early heat and isolated to scattered afternoon showers and thunderstorms. 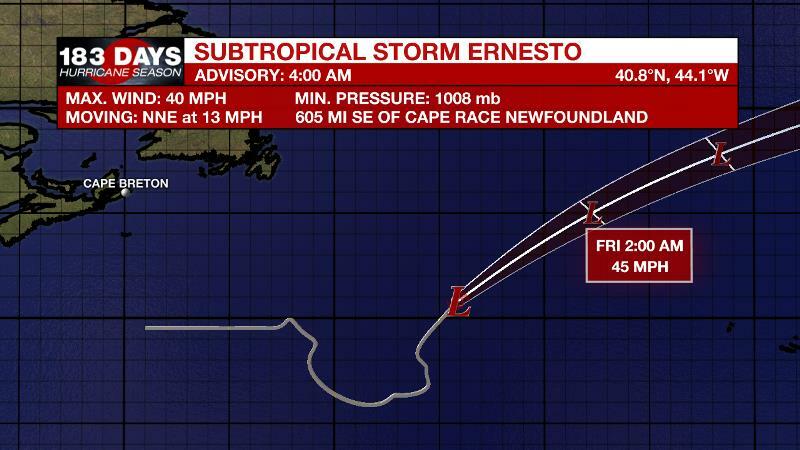 The Tropics: Subtropical Ernesto is moving off to the northeast in the open North Atlantic with 40mph winds. This system poses no threat to North America and will merge with a front near the United Kingdom over the weekend. Much farther south, a disturbance east of the Windward Islands is given a 20 percent chance of development over the next 5 days before it encounters harsh conditions in the western Caribbean Sea. A weak, 500mb ridge will lose its influence over the region as a shortwave trough moves across the Mid-South. This 500mb trough axis will align with the forecast area on Thursday and another perturbation in the jet stream will allow this trough to deepen over the Southeastern U.S. through Saturday. As the initial shortwave moves into the region, instability will increase enough to return scattered showers and thunderstorms to the forecast on Thursday and Friday. While the axis of the trough will exit eastward, northwesterly flow on the backside will be favorable for at least afternoon showers and thunderstorms through Saturday. For the latter half of the extended forecast, the trough is expected to be shunted a bit farther east of the region with perhaps some weak ridging occurring over the local area. Isolated showers and thunderstorms should still begin to develop, but climatologically speaking, a warmer late August atmosphere usually leads to less action. On the days featuring more afternoon showers and thunderstorms, temperature will be seasonably hot but we will have relief from long duration heat due to afternoon rain and cloudiness.